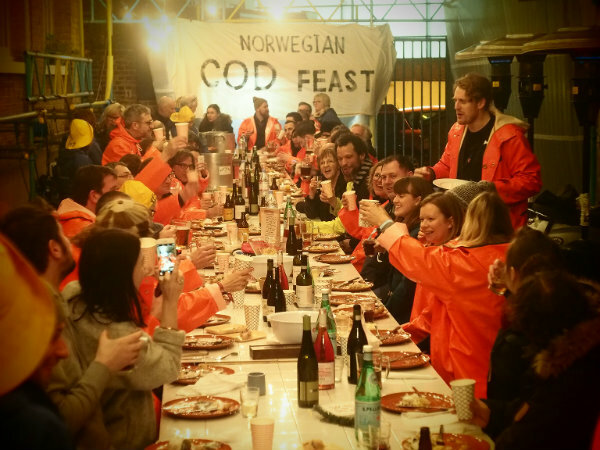 As Norway comes to London to celebrate its fish and fishing with a pop-up Cod Feast, Rachel Walker discovers what it takes to preserve a unique culinary and cultural heritage. “Use two fingers to hold the head firmly,” says Kornelia, jamming her left thumb and middle finger into the cod’s eye sockets, leaving her right hand free to get a good grip on the knife. 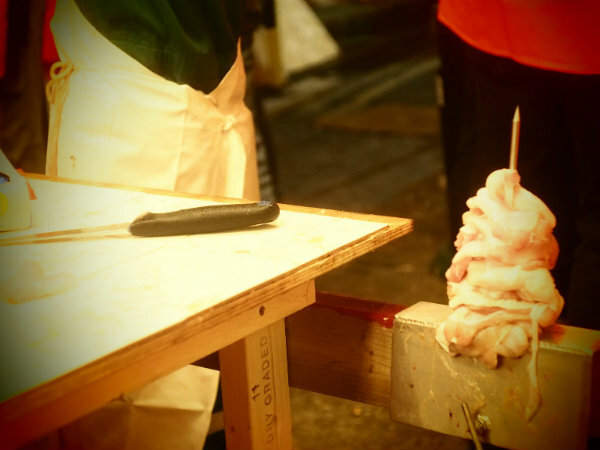 She impales the cod head on to a spike, wiggles it to pierce the tongue and then in one swift slice severs it from the head. Twelve-year-old Kornelia lives on the Norwegian island of Hosøy, nestling in the fjords a little north of Bergen. 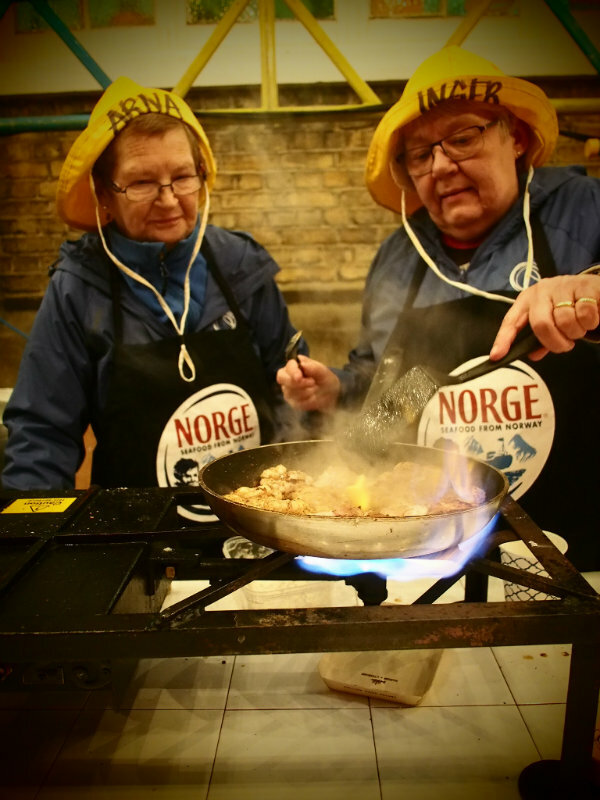 Earlier this week, she flew to London, along with her 11-year-old classmate Isak and 15 “Norwegian grannies” for Codfest, an event hosted by the Norwegian Seafood Council to showcase the traditions surrounding the country’s ancient seafaring heritage. 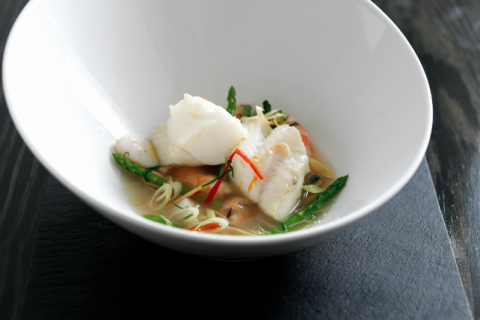 Over the past decade, Nordic cuisine has really burst on to the global stage. René Redzepi’s Noma in Copenhagen was named Best Restaurant in the World for five years in a row between 2010 and 2014. Fäviken has become the latest to make waves, attracting intrepid diners from all over the world to the remote wilds of northern Sweden, where his “spot-lit dining room resembles a wood-cutter’s shack, complete with old wolf skins and slabs of meat for decoration”, according to the 50 Best Restaurants blurb (Fäviken is currently #25 on the hotly contested list – and probably rising). Fäviken chef Magnus Nilsson, a “hyper-local” enthusiast, recently released The Nordic Cookbook, which chronicles the Jämtland region’s culinary traditions in 730 recipes: a wild and exotic collection that includes braised pilot whale and stuffed puffin. It’s an extraordinary celebration of the kind of respect for ingredients, seasonality and old ways – what you might call food with a story – that binds all the “New Nordic” chefs together. Codfest is another. 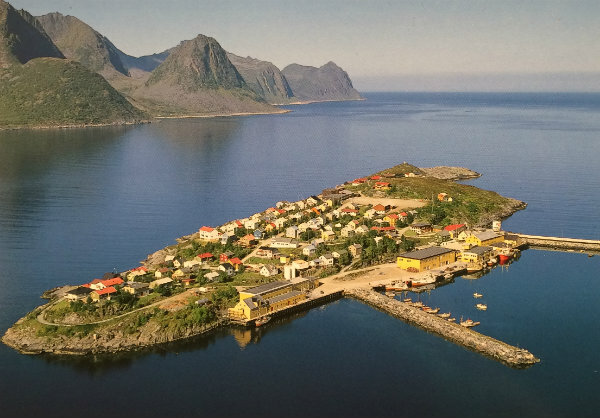 The Norwegian coastline is a mere 280 miles from ours – half the distance Spain is from Britain – but chatting with Kornelia makes it sound like another world, or perhaps another age. 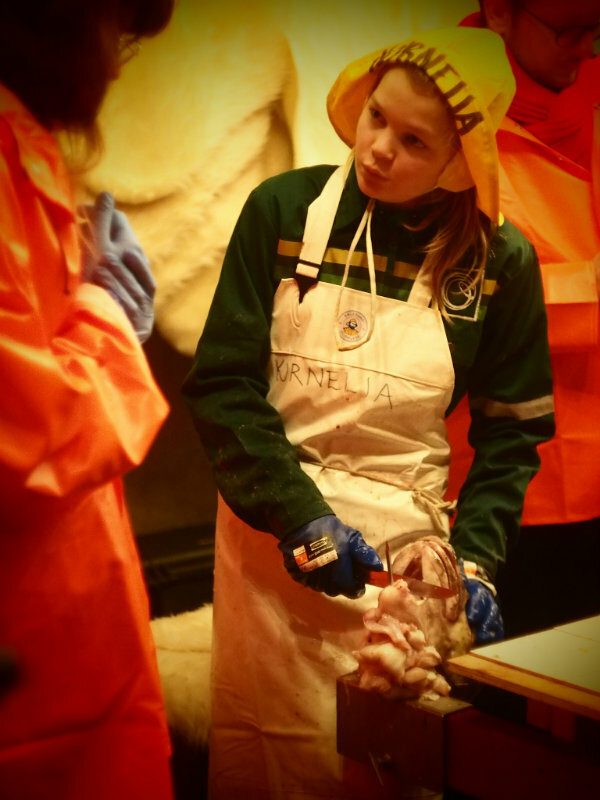 With her blond ponytail poking out from beneath her sou’wester, she merrily tells me about Hosøy and the local school she goes to along with Isak and 43 other children – all the while steadily working through the bucket of cod heads, clinically lopping off the tongues. On 14 January, Hosøy emerges from total darkness. The sun rises at 11:37 and there are 49 minutes of daylight before it sets again at 12:26. But far from being a time of hibernation, January signals the start of the busiest time of the year for the islanders: for the next three months, hundreds of millions of cod migrate back home from the Barents Sea to their spawning grounds of Lofoten and Vesterålen. Fishermen spring into action – and the children too. Kordelia hops with excitement as she explains how everyone at her school is divided into three groups, so that they can work one day in three on a rotation scheme in the island’s fish factory, cutting the cod tongues. On a workday, the children finish school at 2pm, go home to change, and start their shift at 3pm. “The longest I did was ten hours,” grins Kordelia. “But it was really eight because we had to leave the factory for two so they could clean it up, before we started again.” Her tone implies that breaks are considered an inconvenience, not welcome relief. The children are paid by the weight of what they produce, and their lightening efficiency means that they can cut up to 16kg of tongues per hour. The pay is around 24 Norwegian Krone (£2) per kilo, which makes it lucrative work. “I’m saving up for a boat,” grins Isak. Kordelia says she’s saving for a car, but she dreams of buying her grandmother’s farm on Hosøy, so that she can stay on the island forever. “Then my children can cut tongues too,” she says. It’s seen as a rite of passage, which ends when the schoolchildren turn 16 and graduate to the school on the mainland, near Finnsnes. Those who return to work on the island aged 18 are taxed: they find full-time work in the factory, leaving the tongue-cutting to the next generation of schoolchildren. Kordelia shows me how to cut a tongue, and it’s immediately clear that there’s a knack to it. 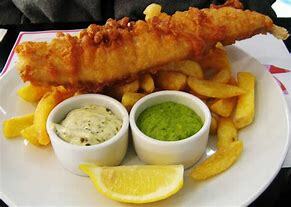 The cod’s head has to be pierced at just the right point, under the chin, so that the tongue can be weaved on to the spike – first piercing the base of the tongue and then piercing the tip. It should take one clean slice to come free from the head, but my knife is at the wrong angle, and I hit the jawbone and have to wiggle the blade before managing to slice it off. The jelly-like wedge of meat fits snugly in the palm of my hand. Cradling it proudly, I head off to find a nearby “granny” to cook it for me. 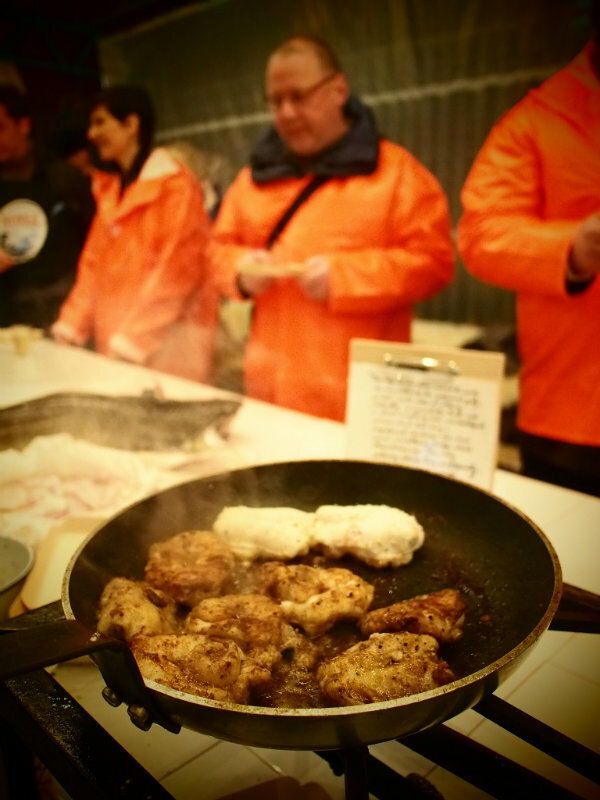 I’ve never eaten cod tongue before, but it’s cherished in Norway, a country that banned discards more than 27 years ago and strives to honour the fish by enjoying every edible part, from the liver to the cheek. The tongue is made up of 80% protein and only 3% fat, and is loaded with Vitamin D. “It’s nature’s way of replacing the sunlight for us,” smiles “granny” Vesla, who is also cheerfully sporting a yellow oilskin sou’wester. She tosses the tongue in seasoned flour, and lays it, lovingly, into a frying pan of foaming butter. A French chef standing next to me is watching her intently. “Can you cook it in white wine?” he asks. Vesla shakes her head, stony-faced. “What about shallots or garlic?” Vesla shrieks with horror. “Absolutely not!” Like many Nordic dishes, this is a dish that should be kept simple and unadorned. The focus is on the fish, little else. The nugget-sized fried tongue is finished with nothing more than a dash of sea salt, laid on a platter and handed back to me. The outside is dark, hot and crisp. I’m expecting a bouncy, scallop-like texture, but the meat inside is almost oyster-like: hot and juicy with a mineral-sweet twang. Later in the evening, Kordelia and Isak lead a sea-shanty singalong, and the grannies are quick to join in. 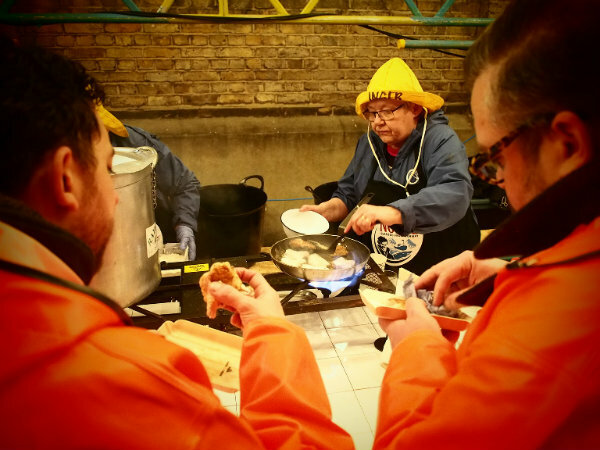 It occurs to me that while the Michelin movement might have put Nordic food on the foodie map, it’s the families – the fishermen’s wives and children – who are responsible for keeping these culinary traditions truly alive. All photos by Jon Bergman, except where otherwise credited. Everyone has their own special traditions at Christmas. 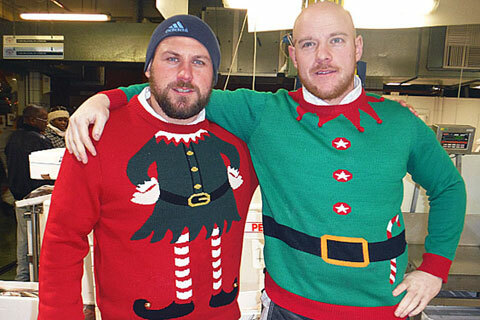 Here’s our roundup of how fishermen, fishmongers and chefs around the UK will be celebrating – and, crucially, what they’ll be eating – over the festive period.